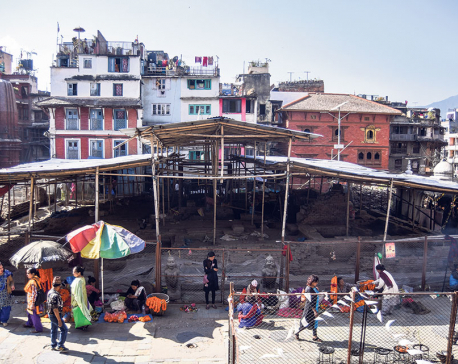 KATHMANDU, Dec 21: The government bodies have taken initiative to use timbers from the Shuklaphanta Wildlife Reserve of Far Western Region for the reconstruction of the historical Kasthamandap Temple. The temple located on the premises of the Kathmandu Durbar Square was destroyed by the devastating earthquake of last year. The temple is one of the seven monuments enlisted in the Kathmandu Valley World Heritage Site. An official at the Kathmandu Metropolitan City (KMC) has been coordinating with the Dhangadi chapter of Timber Corporation of Nepal (TCN) and planning to visit there within a week for the same purpose. “We will go there and study whether the quality of timber that we need for reconstruction of the Kasthamandap Temple can be found there,” Kawindra Nakarmi, an engineer at the KMC, told Republica. As the government had decided to provide the needed timbers to renovate and reconstruct historical monuments, the Department of Archaeology (DoA) requested the TCN to provide around 12,000 cubic feet of timber worth Rs 18 million. “The Kasthamandap Temple was originally built by logs of Sal tree centuries ago,” Nakarmi said. “This time also, we are using Sal tree for its reconstruction.” He also said 20 percent old timbers of the temple can be reused as per the DoA's study. “Reconstructing historical monuments is not only rebuilding the structure but is also about preserving historical arts and culture for the future,” said conservationist and former joint secretary Bishnu Raj Karki, who is also a member of the Kasthamandap reconstruction committee. Birendra Kumar Yadav, general manager of TCN, said that it will supply the timber for the reconstruction of Kasthamandap through its Dhangadi-based office. “We can manage those timbers from fallen trees at the Shuklaphanta Wildlife Reserve of Far Western Region,” he said. A large number of trees have already fallen inside the Reserve and the TCN has said it can produce timbers of 177,000 cubic feet from those trees. “Those trees were fallen down by wind a year ago and the government has already allowed us to collect those timbers,” he said. Yadav informed that the TCN is ready to provide timbers as demanded by the government for reconstruction or renovation of heritage sites. The TCN annually sells 500,000 cubic feet of timbers at the price of Rs 1,500 per cubic feet. Earlier, the cabinet had directed the TCN last September to manage 800,000 cubic feet of timber for the reconstruction and renovation of historical monuments. “The government has demanded 800,000 cubic feet timber for the next five years and we will distribute 200,000 cubic feet annually for the next three years and 100,000 cubic feet annually for the remaining two years,” Yadav added.